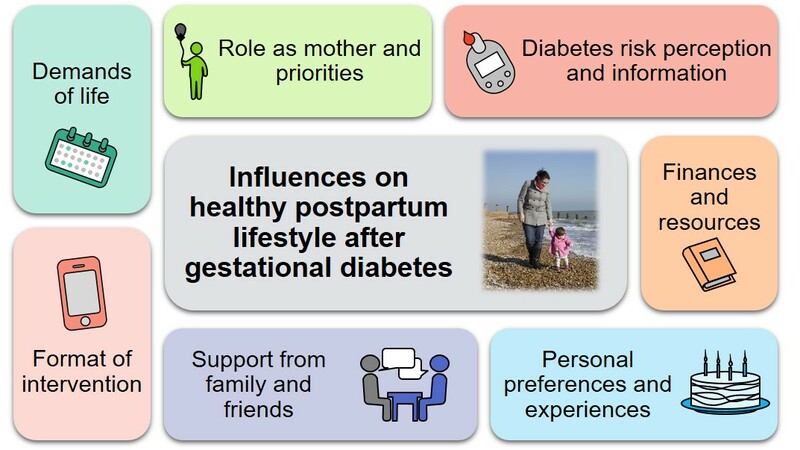 Mothers who experienced gestational diabetes during pregnancy face a high risk of developing type 2 diabetes later, but diabetes prevention programmes do not fit well with their lives as mothers of young children, according to a new review of published studies by Becky Dennison with colleagues in the Prevention Group. The 21 studies that the team reviewed mostly report findings from interviews and focus groups about women’s experiences, views, perspectives and beliefs. The findings show that women’s diets and levels of activity are influenced by a drive to prioritise their family above themselves and by access to resources, time, energy, information and support. The researchers carried out a qualitative synthesis of the results, labelling themes and grouping the findings to gain the best possible understanding of the varied lived experiences of the women in the studies. 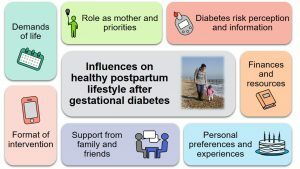 Six areas of influence on women’s diet and exercise after gestational diabetes were identified: women’s role as mother; support from family and friends; the demands of life; women’s personal preferences and experiences; their diabetes risk perception and the information they have; and finances and resources. “I was exhausted and already feeling so guilty for being away from my child while I was working so I did not exercise” – mother. Others said they needed to make changes so they could be well enough to look after their families and model healthy diet and exercise to their children. Recommend flexible exercise such as walking and those performed around the home or with the baby to increase levels of physical activity. This research was funded by the NIHR School for Primary Care Research.